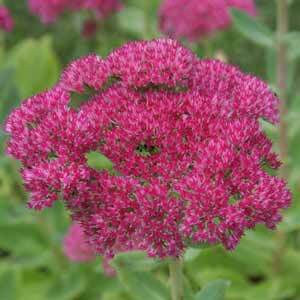 Easy to grow, reasonably drought tolerant and very low care, Sedum ‘Autumn Joy’ is long flowering and reliable. It comes into its own in late summer when the green flowers turn to pink and then terracotta. The flowers appear on tall stems reaching around 80 cm (30 inches) in height. This is a succulent plant that has flowers on tall stems. As the season progresses the flowers change colour from a bright pink to a coppery tone. You can grow this butterfly and bee attracting plant as a ‘stand alone’ in a container or the garden border. It can be mass planted, or mixed in with contrasting companion plants. This is a trouble free plant that will benefit from being dug and divided every 3 – 4 years. Plant Sedum ‘Autumn Joy’ in a sunny position in a well drained soil. A little fertiliser every year will suffice as this is not a hungry plant. You can tip prune early in the season to promote a more bushy habit, however we tend to let it ‘do its own thing’. Simply prune right back to the ground once the flowers dies back. You will notice basal foliage when pruning, prune back to just above this. Very easy to propagate by division, best carried out in spring. Simply dig the clump, divide into sections and then replant. Suitable companion plants need to like the same growing conditions, good sun and a well drained soil. Consider trying Joe Pye Weed (Eutrochium) “Chocolate” with its dark folaige. Others to consider include : Salvias and Agastache, ornamental grasses such as Poa, Blue Fescue. Nepeta varieties and Dianthus can also work well. Try using Sedum ‘Autumn Joy’ in front of evergreen shrubs where it will contrast nicely when in flower. Sedum Autumn Joy is available for sale from the following suppliers.